Mac Design inspired by some simple and iconic design mac. 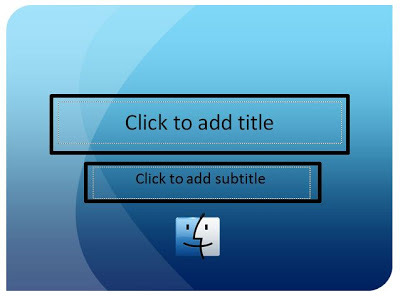 Using animation to enhance your powerpoint 2010 animation between slides. Changing slides will be very nice and interesting to watch. The main menu on the title page as the above screenshot, mac menu when clicked will go to the next slide which contains the folders that have been given a hyperlink to the slides that have been determined. You can change the slide posts as you like or you just want a hyperlink and keeping only then delete the folder. Article for menu design is not so different from the title page. Charming blue background adds elegant impression and it looks professional presentation.